In the Fantasy Baseball Guide 2013, rather than ask Don Drooker (XFL winner for the fourth time in 10 years, and three of the last four), Alex Patton (American Dream League champ 2010, 2011 and 2012), and Larry Schechter (Tout Wars Mixed champ 2006, 2007, 2008 and Tout Wars AL champ 2011 and 2012) to once again write Strategies of Champions pieces for the Strategyland section, I asked them to talk amongst themselves (and with me) about their approaches and their methods and why they thought they were winners. Their discussion is illuminating, because we get a little look at how these three winners work, but one interesting sidebar didn’t really fit the piece even though I thought it had some very interesting material about how we weight the draft versus in season activity. 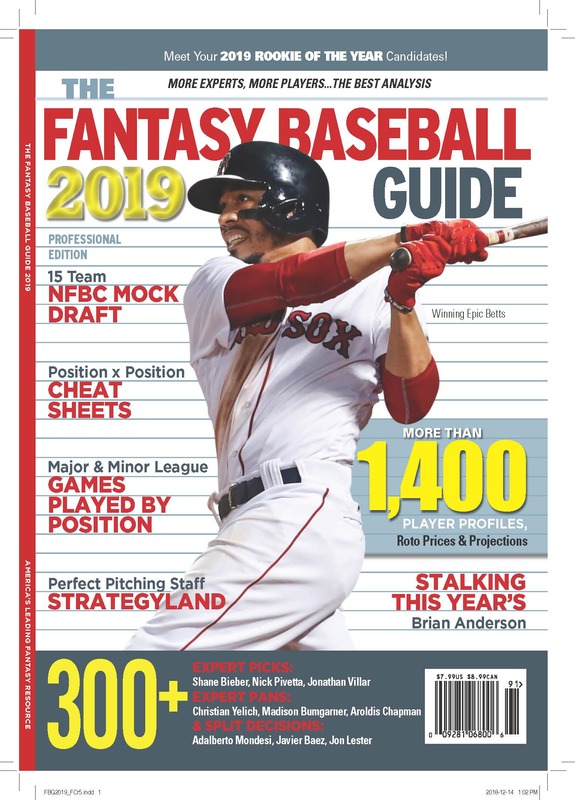 If you would like to buy the online version of the Guide, please visit www.thefantasysportsguide.com, or look for the magazine on newsstands starting the first week of February. GUIDE: It seems to me that if everyone is a competent player it’s much harder to find an edge in the draft, but during the season you have a few different ways, via roster management, free agent wire and trading, to assert your superiority over the other players. I know from playing with you guys that you’re all aggressive and competitive during the season. I’m surprised you don’t think you might be a little smarter, too. LARRY: I hesitate to say this, because it would look bad if you print it, but yes, I would say I think I’m better than the average player at this. When you say “everyone is a competent player” that doesn’t mean they are all fairly equal. There are some very good players in Tout Wars, LABR, XFL, etc., and there are some who are only decent or pretty good, and there are a handful who are not very good at all. I would say that the draft/auction is the most important aspect of winning. In-season moves would be secondary. DON: Larry shouldn’t hesitate to say he’s better. When you win a league once, it could be a fluke…when you win it twice, it becomes a trend…when you win it three times or more, everyone figures out that you’re good. To Alex’s point, the Draft should always be the most important factor but realistically, there are probably a handful of teams (that means up to five) leaving the table with a chance of winning. That also means there are 7+ teams that will not be in the hunt for the championship. LARRY: Agreed. When I leave an auction, I think I have the best team and the most dollar value for my $260. But that’s not a surprise because I bought players based on my own values. Everyone should think they have the best team. If not, there’s something wrong with how you’re drafting. Some players will get hurt and under perform, some will over perform; and some people will gain some benefit from FAAB moves. But overall, it’s not likely a team will be more than +/- $20, maybe $30, from their original value. Thus, it’s going to be something like less than a one-percent chance teams No. 8-12 can possibly win. Teams No. 5-7 have a pretty small chance. No. 4 has a shot, but the winner will quite likely be No. 1-3. GUIDE: The problem with projected value is that any of those teams could take big hits and get knocked out. You buy a projected $290 team and then lose Carl Crawford, it becomes a $270-$275 team last year. Luck isnâ€™t factored in. The team that bought the most stats in the draft ended up with $278 at the end of the season, losing $98 of value. LARRY: Wow. Thatâ€™s surprising. I’m certainly not saying trades and FAAB don’t matter, but I still think the team you draft is more important (usually, anyway). I should point out, too, that the draft day roster standings can be a little misleading. For example, it doesn’t give me credit for having Rafael Soriano on my reserve list. It assumes Mariano Rivera was in my starting lineup all year. GUIDE: Yeah, that’s the sort of thing that doesn’t show up. I think reserve picks should be included, because you deserve credit for drafting the handcuff, but they arenâ€™t here. In any case, this tool is just a rough approximation. It helps us to see what happened, we have to look more closely to draw a clear lesson. ALEX: If there’s that kind of discrepancy between the hypothetical and actual final standings in leagues in general that there was in Tout Wars this year, the game has fundamentally changed. It used to be that the team with the best draft was a big favorite, and the evidence in hundreds of leagues was overwhelming. So, if there has been this kind of change, I wonder what’s caused it? GUIDE: Lots of little changes to the way the game is played now, but this could also be the result of increased parity. We’d need a lot more samples to sort it out.